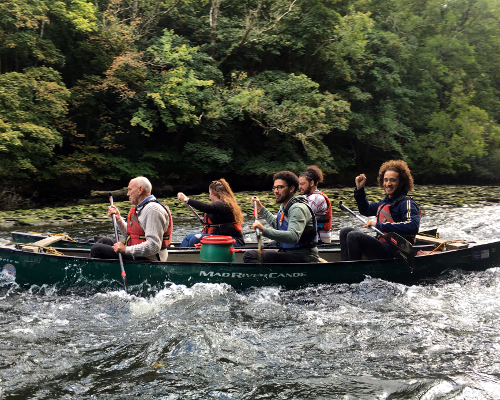 Our adventure Canoe trip on the lower Teifi heads from Llechryd down the gorge on a peaceful section of river as far Cardigan passing the Teifi marshes. This trip takes between 4-5 hours. This trip is a peaceful paddle looking at the surrounding natural environment, your Guide will talk to you about the history and wildlife in the gorge. During the trip we ask that you bring a packed lunch, as we stop at a peaceful spot to soak in the environment, have a brew before continuing down river. Winding towards the sea the deep, tidal Teifi Gorge is a unique environment where fresh and salt waters meet. Due to it’s wide array of species it forms one of the most varied aquatic landscapes in the country. The gorge itself was hewn through a slate hill by a glacier retreating to the Irish Sea at the end of the last ice age. 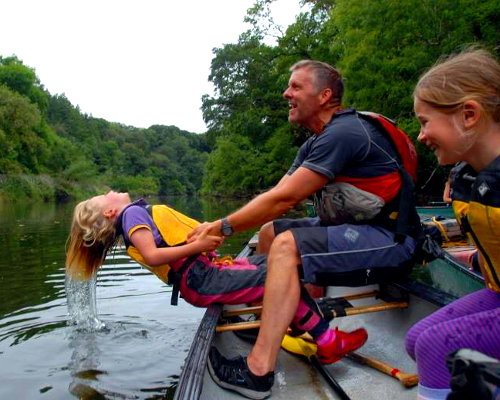 The Teifi Gorge is one of the best examples of tidal gorge in the whole country and offers a safe and awe inspiring location for your whole family to try a fun new sport. The steep, densely wooded banks form an important habitat to species of Otter, Red deer, Peregrine falcon, Kingfishers, Dragonflies, Salmon and Sewin (Sea trout). The gorge has been an important centre of coracle fishing and slate quarrying for hundreds of years but now the gorge forms part of the Teifi marshes nature reserve. Canoeing in the gorge is a stunning adventure in the silent and untouched Teifi Gorge. The river is very slow, flat water for most of the journey and there are a set of gentle rapids which you can run at the end of the trip. Expect to see native wildlife including Kingfishers, rare Dragonflies and if you’re really lucky an Otter! Minimum age: 3 no experience is necessary, you can even bring a well behaved dog! Sensible footwear which may get wet (if you are unsure please ask). Sun cream (yes, even in Wales). Camera (optional) We can not guarantee it will stay dry. We meet you at the start location where you leave your vehicle during the trip, after the trip we will give you a lift back to the start. Yes but this is not common, don't worry though nearly always people fall off the side before the canoe tips. The way down the canoe launch is about 20ft and on rough ground, however we have taken people who are wheel chair bound by helping where asked. We do our best to accommodate your wishes to make things happen. No it is unnecessary you should stay in the canoe but if you are nervous we can join two canoes together to make a stable craft . Yes - all water activities can be done in the rain.